The story of the first couple of months is pretty straightforward: oil prices fell in January and came back up in February, and there wasn't much in the way of significant exchange rate movements. By the end of February, we were pretty much where we were when the year started. And then March hit, with important swings in both oil prices and in exchange rates. In the Euro zone, an appreciating currency attenuated much of the rise in oil prices, and oil was slightly cheaper on March 20 than it was on Jan 2. 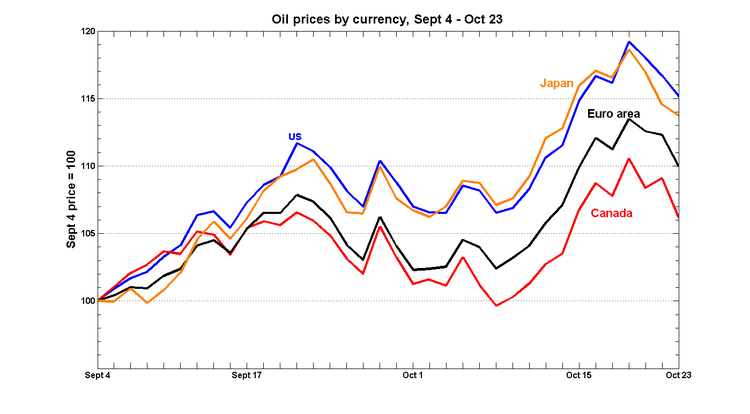 The even stronger appreciation of the yen means that oil prices in Japan are 7% lower than when the year began. The CAD has been tracking the USD pretty closely over the past few months, but the recent drop in oil prices has been offset by a depreciating CAD. 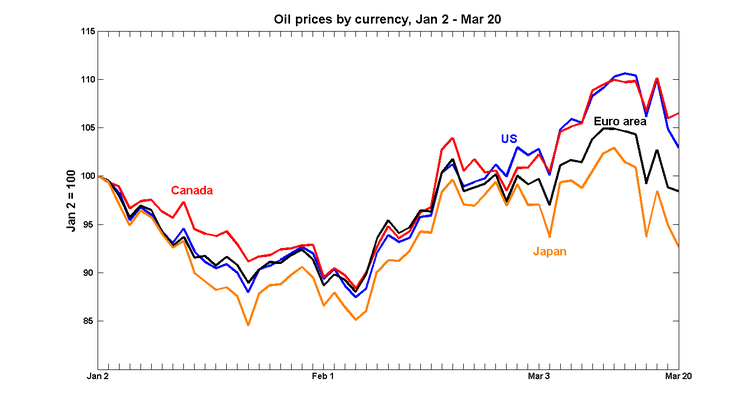 The net result is that CAD oil prices are still more than 5% higher than at the beginning of the year. 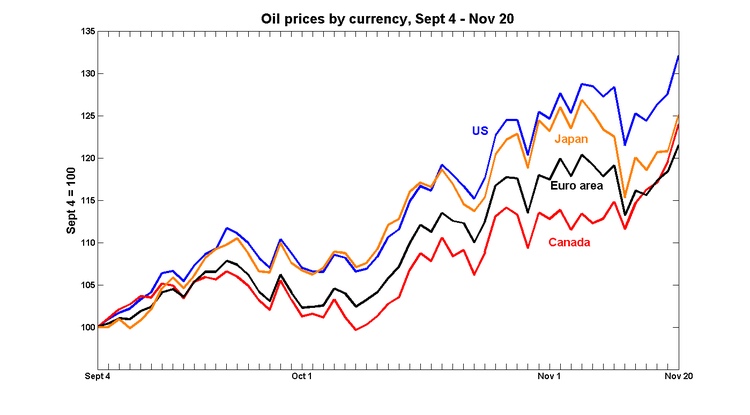 As long as forex markets peg the CAD to oil prices, the CAD value of oil exports should hold up. In the last four weeks, the CAD has depreciated against the USD, and the yen has appreciated; the net result is that the CAD-yen exchange rate is pretty much where it was on Labour Day. If I were a currency trader on September 4, and if and someone told me that oil prices would jump 25% in the next 3 months, I would have bet on a sharp appreciation of the currency of the country that is a net exporter of oil against the country that is a net importer. Good thing I have my day job. So the run-up in the USD oil price is not entirely a story of USD weakness. But as far as the euro area and Canada is concerned, exchange rate movements are an attenuating factor. Update: The graph up to November 20. Oil sands royalties were set at a time when the very few participants in a fledgling industry were struggling. The royalty and tax regime for oil sands no longer reflects a fair share and balance between owners (Albertans) and the growing number of producers. Alberta's market power is growing, and it's hard to see why they wouldn't - or shouldn't - start thinking about how best to make use of it. After Stuart's monumental research, I really think the burden of proof is on those who claim that Saudi Arabian production can continue to increase. At this point, we need not the conclusions of experts nor the reassurances from Aramco, but hard data to support the claims. If Saudi production is permanently on the way down, we have just entered a new phase of history. One in which Alberta's oil sands will likely play a major role. Total SA took the first step yesterday toward building a multibillion-dollar bitumen upgrader near Edmonton, a construction project that will require 4,000 workers - about what it took to build the iconic Hoover Dam. Huge oil sands projects have become almost commonplace, but their enormous scale is still impressive. Each effort requires a work force that would populate a small town. In the 1930s, it took an average of 3,500 workers - and a peak contingent of 5,200 - to build the Hoover Dam near Las Vegas, one of the largest construction projects undertaken to that date. Total is the second large international energy company in the past two weeks to announce it is proceeding with a major development. Statoil ASA of Norway in late April paid $2.2-billion to buy an undeveloped property, saying it can overcome the various challenges. Developing the oil sands will be profitable without preferential treatment; it's time to rethink those incentives. Last month, the government of Quebec and Alcan cobbled together a deal in which Alcan agreed to invest $2b in order to build a new aluminum smelter in the Saquenay-Lac St Jean region; the selling point was the creation of 740 jobs. A $400m interest-free loan over 30 years. It turns out that this is a particularly rancid piece of pork. My colleagues Jean-Thomas Bernard and Gérard Bélanger decided to take some time to put a dollar figure on the value of the electricity subsidy, and they published their results in an op-ed article in the print version of today's Le Soleil (their original text is available here). They conclude that in each of the 30 years of the project, the Quebec government's contribution amounts to $336,000 per job created. Between now and 2020, production from the oil sands is likely to increase by about 2 million barrels per day - almost the equivalent of the arrival of another Venezuela on the world market. I've been trying to get a handle on the effects that the development of the tar sands will have on Canada (I use the terms 'tar sands' and 'oil sands' interchangeably). I'm not done yet, but this graph shows why it's worth thinking about. A lot. In an earlier post, I noted that the relationship between the CAD-USD exchange rate and oil prices hasn't always strong as it has apparently been over the past few years. Since I hadn't been able to sort this problem out on my own, I went into last weekend's session on this topic organised by the Bank of Canada at the meetings of the Canadian Economics Association with a certain amount of the hope. Happily, I wasn't disappointed. Should Canada be restricting oil exports? Canada is now the largest foreign supplier of oil to the US, to the tune of some two million barrels of oil a day. Should we be? Shouldn't the Canadian government be trying to keep that oil here in order to satisfy our own energy needs? A non-economist might be inclined to respond in the affirmative: the prospect of running out of fuel seems the sort of thing that a government should be trying to prevent - especially in a country as cold as ours! But that's not how an economist would look at the problem. 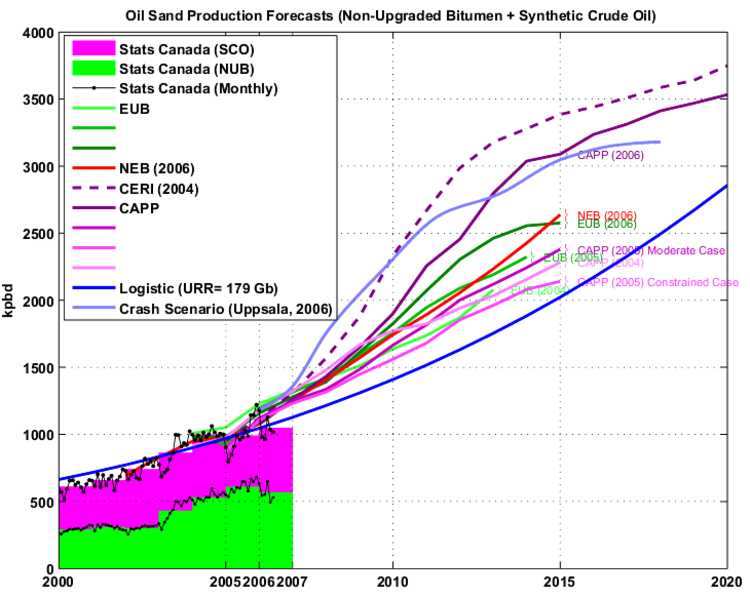 One of the reasons for interest in oil sands is the potential magnitudes involved. The Alberta Energy and Utilities Board estimates the ultimate volume of Canadian bitumen in-place at 2.5 trillion barrels, which if it could somehow all be extracted would be enough to satisfy by itself the entire world petroleum demand at current rates for 80 years. Even if only a tiny fraction of this proves ultimately to be developed, this would be a very important resource indeed. Nor is the exploitation of this resource merely a theoretical possibility. Almost 40% of Canada's current crude oil production of 2.6 million barrels per day is derived from oil sands. About 1/3 of current production is from in situ methods, in which the oil sands are heated while still underground, and 2/3 from open-pit mining and above-ground processing. He notes that there are several obstacles before all this becomes a reality, most notably the massive capital investment that will be required. North of the border, of course, we've been talking about the oil sands for quite a while, but generally with such qualifiers as 'may possibly' and 'in the not-too-distant future.' It's only recently that discussions of their effect on world markets have started to have policy implications for the here and now. On the weekend, NDP leader Jack Layton proposed a neighbourly warning that Canada is prepared to impose export duties on oil and gas exports to the United States if they don’t agree to respect NAFTA and refund duties. As things stand, this is more than a bit silly: we don't have the market power to move oil prices on our own. Le Devoir: Hydro pourra répondre à la demande: Même si 55 000 nouvelles maisons se sont branchées sur son réseau cette année, même si le très bel été a fait baisser le niveau de l'eau dans ses réservoirs et même si la hausse du prix du pétrole aura pour effet d'inciter un plus grand nombre de consommateurs que d'habitude à se convertir à l'électricité, Thierry Vandal, le grand patron d'Hydro-Québec, donne l'assurance que la société d'État a suffisamment d'approvisionnements en énergie pour que ses abonnés traversent les longs mois d'hiver dans le confort. This is serious business: 80% of Quebec households use electric heating. And whatever water is going to turn the turbines during the winter better be in the reservoir now, because there won't be much rain over the next 6 months. The article raises another issue, one that my colleague Jean-Thomas Bernard has been talking about for years. New power generation costs around 0.13$ per kw/h, but the government-imposed rate that households pay is less than half that. Quebec often congratulates itself from having insulated itself from the vagaries of oil and natural gas prices, but it can't keep prices below marginal cost forever.